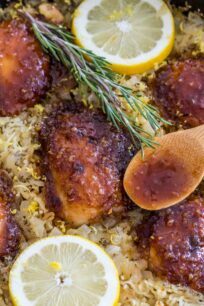 Garlic Lemon Chicken is very easy to make and cooked together with the rice in one pan for a well-rounded dinner. Finished with a sticky honey lemon glaze, that is impossible to resist. 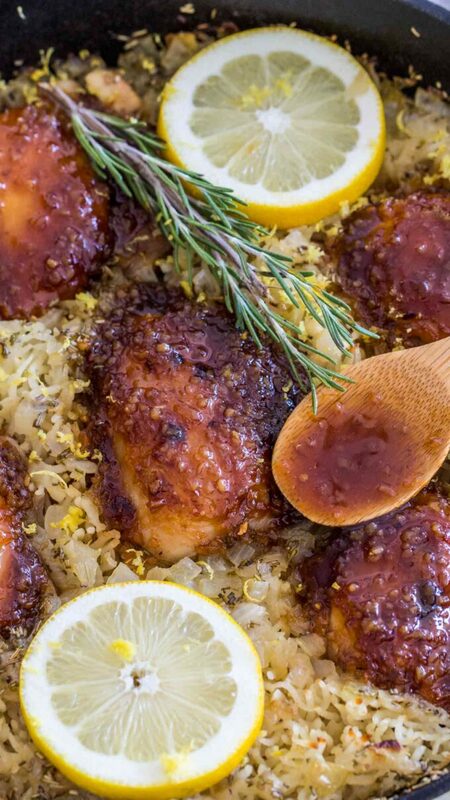 This easy chicken and rice dinner is a twist on our very popular One Pan Honey Garlic Chicken and Rice. This weeknight staple is incredibly easy to make and with budget-friendly ingredients. If you are a fan of quick and easy dinners, check our Orange Beef and Spicy Bourbon Chicken. 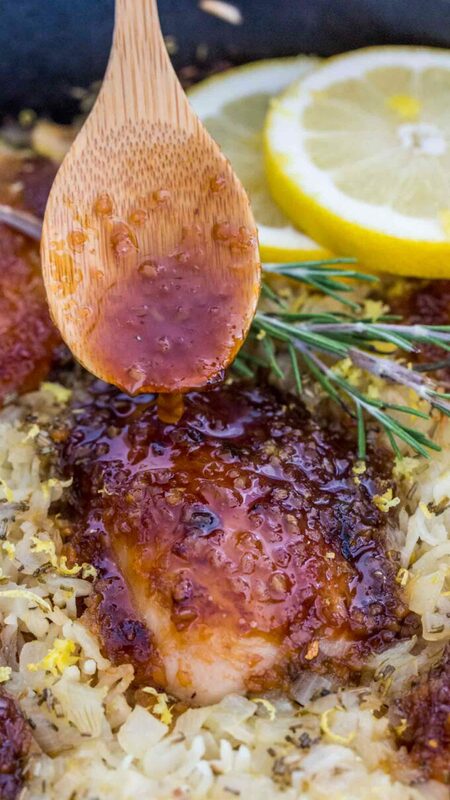 One Pan Lemon Chicken with Rice is such an amazing dinner, that once you try it, you will make it over and over again. This dish is loaded with fresh lemon flavor, that is perfectly balanced by the savory garlic and the sweet honey. This meal can be made with chicken thighs, either boneless or bone-in, and as well you can easily make it with chicken breasts. We prefer to use thighs as they are usually more tender, and once baked with the rice, they become extra soft and juicy. The honey lemon glaze is a MUST have and its the star of this recipe. It elevates a regular chicken and rice dinner from basic to amazing. The glaze is so good and can be used in many other recipes, including to top beef or fish. Use quality meat as it will make a difference. This recipe can be made with skin on – bone-in chicken thighs and with chicken breast. You don’t have to adjust the cooking time for bone-in chicken thighs. If you intend to use chicken breasts, check below the cooking time adjustments. If you don’t like the skin, you can remove it. However, cooking with the skin not only protects the meat from drying out. It also gets the meat bathed with the flavor from the skin while it cooks. Also, if you are allergic to honey, you can replace it with maple syrup. Similarly, use fresh garlic and ginger to add a punch of extra flavor to this dish. If you would like to spice it up, add more red pepper flakes. Rice vinegar can be replaced with apple cider vinegar or any white vinegar. Lemon is ideal in this recipe because it is acidic. This helps balance the stronger flavor of the dark meat in thighs and legs and the fat from the chicken skin. The lemon juice and zest can be replaced with orange juice and orange zest for an Orange Chicken and Rice version. HOW TO MAKE THIS MEAL USING BONELESS CHICKEN BREAST? First, sear the chicken in some oil, until it is golden brown about 4-5 minutes on each side. Set aside. Next, follow the instructions on how to cook the sauce and after that the rice. Cover the pan with THE RICE with foil and transfer into the preheated oven, cook covered for 25 minutes. After that, add the chicken breasts on top of the rice, cover again with foil and cook for another 20 minutes. Follow the instructions on how to add the sauce to the meat. Bake until nicely browned uncovered and serve. What do you eat ONE PAN LEMON CHICKEN WITH? The beauty of this recipe is that everything is cooked in the same pan, the protein, and the side. Since a full dinner is cooked, we recommend just adding a light salad on the side and choose a light and refreshing wine to go with the meal. How long do you cook chicken in the oven? To be safe that you are no consuming raw poultry we recommend that you always check the internal temperature of the meat with an instant thermometer. Poultry is done cooking when it reaches an internal temperature of 165 degrees F.
This steps will add a nice golden-brown color and also lock in the flavors and juices, which will make the meat more tender and incredibly good. After the thighs have been good and set aside, add the ingredients to make the sauce into the same. The sauce needs to be simmer until its smooth, glossy and thick. To thicken it more add the cornstarch slurry. Transfer it to a bowl once cooked and set aside. Add the butter, onion, rosemary, lemon zest and rice to the same pan and lightly brown, stirring for 1 minute. Next, add the broth. Add back the meat to the pan, on top of the rice. Cover tightly with foil and cook. A few minutes before removing it from the oven, top the thighs with the glaze and cook uncovered until nicely browned. DO I HAVE TO MARINATE the chicken? If you want more flavor to it, marinating the meat is the best option. However, if you are in a hurry, you can absolutely skip the marinating time in this recipe. The chicken won’t have absorbed as much flavor, but it will still delicious. We recommend to marinate it for at least 30 minutes. This dinner is not only easy, but it also makes delicious leftovers. Store any leftover glaze sauce into an airtight container and store separately the chicken and rice. When ready to reheat and everything to a microwave-safe plate, drizzle the glaze onto the meat and microwave until hot. 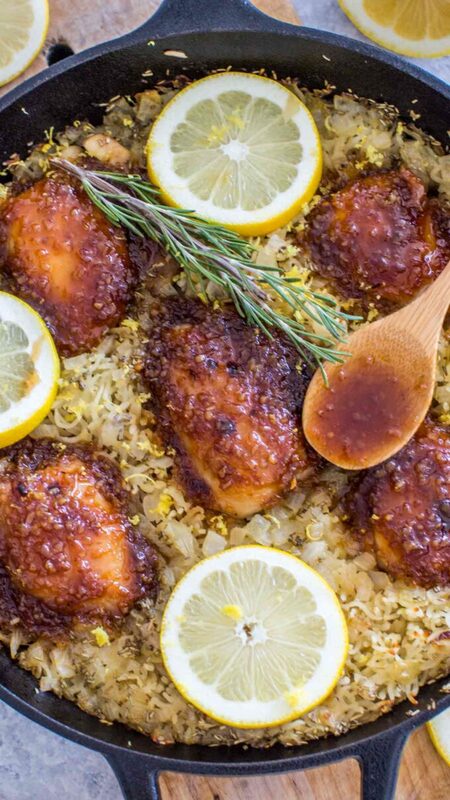 Honey Garlic Lemon Chicken is very easy to make and cooked together with the rice in one pan for a well-rounded dinner. Topped with the perfect honey lemon glaze. Preheat oven to 350 degrees F and set the oven rack into the middle of the oven. Season the chicken with some salt and pepper on both sides. Place a cast iron pan, 9 or 10 inches large, over high heat and once hot add the oil. When the oil is hot, add the chicken, (skin side down, if using skin-on chicken thighs) and cook until browned, 4-5 minutes on each side. Set aside onto a plate. To the same pan, add the garlic and cook stirring for 1 minute. Add the rest of the sauce ingredients and cook on medium heat until the sauce reduces in volume and thickens slightly (about 5-8 minutes). Stir occasionally. If you want the sauce thicker, cook on low for longer, or add the mentioned cornstarch slurry by mixing two tablespoons of cornstarch and water until fully dissolved and adding the mixture to the sauce. Transfer sauce to a bowl. Set aside. Reduce heat to low-medium and add butter to the same cast iron skillet. Once the butter is melted, add the diced onion and cook for 1 minute, stirring. Add in the uncooked rice, dried rosemary, and lemon zest. Stir and cook for a minute. Pour in the chicken broth, stir to combine. Add the meat back to the pan, on top of the rice. If using skin-on thighs, place them skin side up. 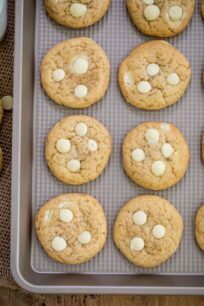 Cover with foil and bake in the preheated oven for 45-50 minutes. When 5 minutes are left, uncover, brush the meat with the sauce and broil for 5 minutes. Serve with lemon slices, fresh parsley, and extra Honey Lemon Sauce. 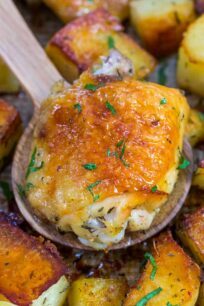 Chicken and Potatoes – 5 Ingredients Only! This is making my mouth water, it looks SO good! This is my kind of a chicken dish! I have to make this over the weekend it looks great! We eat chicken a couple nights at week in our house, so I’m always looking for a new recipe. This one looks delicious…can’t wait to make it! Oh goodness…..that sauce looks sooo flavorful! This sounds so amazing! 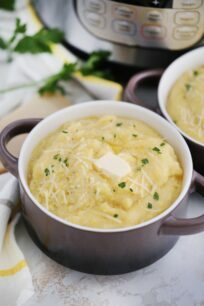 Perfect comfort food and an awesome meal any night of the week! Made this recipe with some adjustments and substitutions… flavors are so awesome! I am on a special eating plan and did some edits. Used Liquid Amino instead of Soy Sauce. Used riced cauliflower instead of rice. I reduced the amount of liquid at the end since I wasn’t cooking real rice which would absorb all of that liquid. I underestimated how much liquid the frozen riced cauliflower would create. I ended up with a lot of liquid that I drained off. The flavors were all still there. The next time, I may just make this for lunches and use rice. I think using Pam spray instead of the the oil/butter would work. Alternatively, I could precook the riced cauliflower and make sure most of the liquid is gone then combine to get the flavors.